This unique title provides in-depth description and analysis of tax systems worldwide. Combined with practical guidance on international planning approaches from a team of both tax practitioners and academics, this title will enhance planning for optimal specific arrangements in each cross-border business operation. In addition to frequent references to country-specific tax legislation — including laws and rules in all EU Member States plus the United States, as well as special provisions in Australia, Japan, and elsewhere – the book discusses important ECJ decisions and numerous other case studies. the proposed EU Common Consolidated Corporate Tax Base (CCCTB). 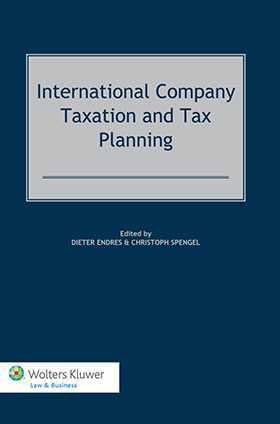 International Company Taxation and Tax Planning by Dieter Endres and Christoph Spengel will be welcomed by practitioners engaged in the field of international taxation, whether they work in companies, law firms, or government. Interested academics will find here an unmatched comparative analysis of the global web of international taxation law and practice. Introduction: Objective and Structure of the Book. PART I Taxation of Businesses and Individuals – An International Comparison. Chapter 1 Taxation of Income, Wealth and Consumption. Chapter 2 Taxation of Individuals (Personal Income Tax). Chapter 3 Taxation of Business Profits. PART II International Business Taxation. Chapter 7 Fundamentals of International Taxation. Chapter 8 Taxation of Cross-Border Investments. Chapter 9 Allocation of Profits. Chapter 10 Proposals for Reforming Company Taxation within the EU: The Common Consolidated Corporate Tax Base (CCCTB). PART III International Tax Planning. Chapter 11 Introduction to International Tax Planning. Chapter 12 Target Variables for International Tax Burden Comparisons. Chapter 13 Case Studies on Domestic Tax Planning: Financing of Corporations in Different EU Member States and the United States. Chapter 14 Case Studies on Cross-Border Tax Planning. Chapter 15 Mergers & Acquisitions. Chapter 17 Optimizing the Value Chain.